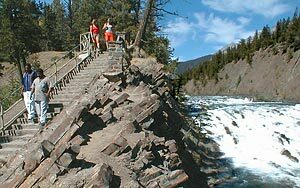 Separate trails for pedestrians and cyclists meander along the south shore of the Bow River and past roaring rapids before climbing up above the Bow Falls. Bicycles are not permitted on the clifftop section. The clifftop section is closed in winter. Several classic Hollywood films of the 1950s depicted famous movie stars being swept over Bow Falls, including Marilyn Monroe, Robert Mitchum – even the Son of Lassie.